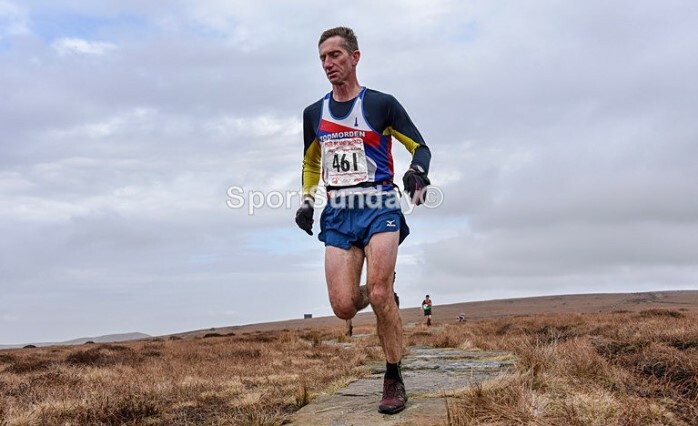 The English Fell Championships were underway on Sunday 11th March with the Edale Skyline fell race. This is an iconic race in the fell running calendar dating back to its first event in 1974. It’s a long tough race with often challenging conditions. There were 9 Todmorden Harriers who turned out to test their early season fell running form on this 20 mile route with 1327m of climb. The race winner was Carl Bell in 2.37.13 from Keswick AC. The female race was won by Nichola Jackson of Ribble Valley Harriers in 3.09.54. Andrew Worster continues to show his great running form, coming 45th for the Harriers in 3.06.29. Graeme Brown was next to finish in 3.18.52 for 82nd, closely followed by Jon Wright (pictured) in 3.20.41 for 92nd place. Annie Roberts was the first female back for Todmorden in 3.46.01.